After exceptionally disruptive winter weather, the work of covering over the centre was finished in March 2009 and the inside work could begin. By April, this level of work here had intensified. The technical support for the building began to be put in place on the slopes and under the covering. The firms responsible for strong and weak currents are in the process of laying down 400 km of cables. The work going on in the areas of the slopes adds complexity to the jobs and materials required. As a result and because the area is so charged with people and supplies, all of the companies involved have adopted the same hygiene and security rules. 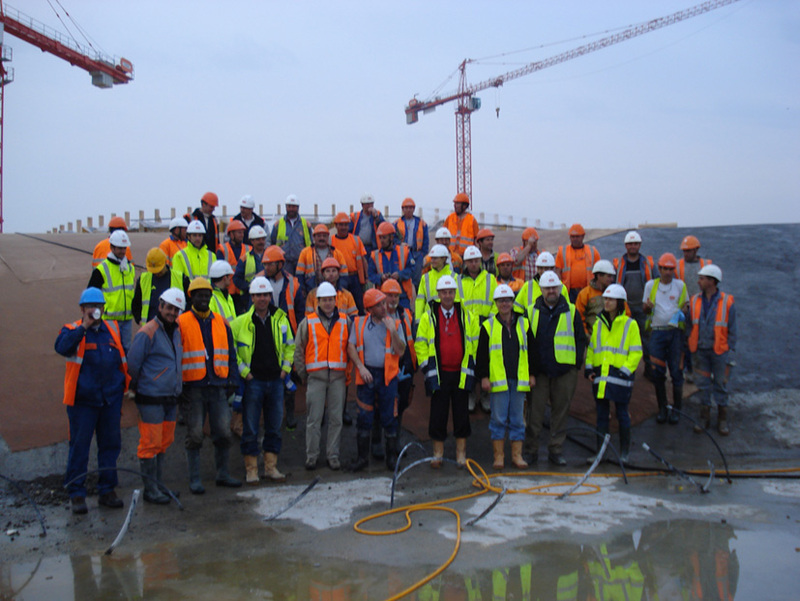 Dominique Carrel, the security supervisor, and the entire project management team from Losinger are working closely with the Prime Contractor to refine operational security procedures. Everyone, from the workers to supervisors, managers and contractors, are keeping a close eye on the site at all times in order to eliminate security risks. There are some new features on the home page of the Rolex Learning Center website! We proudly present "the Rolex Learning Center in numbers" and "live"! Thanks to Losinger and the Main Library, each week you will be able to discover a new number related to the building, its future inhabitants or the campus around it! Thanks to the webcam on top of Losinger's Agency, you can now keep an eye on the work site 24/7! Don't wait and visit http://learningcenter.epfl.ch! Our heating, ventilation, sanitation and electricity (CVSE) team is now at work on the first phase of constructing the raised floor that will run along the main floor in the northeast part of the building. Our expert electrician Jean-Pierre Ramseyer is in charge of the crew. In the end carpeting will cover the concrete slab that holds the under-floor heating elements which rest on a Holoryb-type steel sheet. 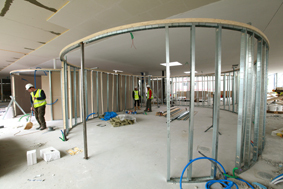 The unit is held in place by a series of small walls some 60 cm high for the flat parts of the building. This space will be closed permanently. The heating and ventilation units will use the space, as will rainwater evacuation pipes and a multitude of electric cables tubing used to supply underground wiring and the building’s automatic electricity management system. All of this will be insulated from the underground area and outside by a thick layer of materials, always in keeping with Minergie requirements. This network had to be used because the formwork for the 10,000 m2 of concrete shells made it impossible to create openings in advance. Pierre-François Blanc, Technical Management, is responsible for coordinating the work, and the companies involved, on what is yet another very complex part of the construction. 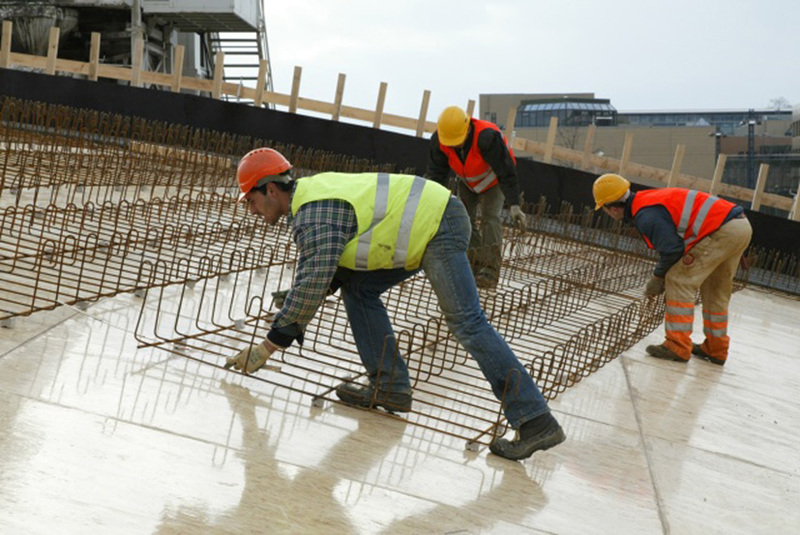 An overall quality checklist document is being drawn up to ensure that we have the best possible record of the work of the seven sub-contractors, of our partners Losinger for the masonry and of the calculations of the companies hired to carry out work. It includes the preparatory work for the “As Built” document, with video recordings of each space before it is permanently closed. A temporary enclosure has been created to allow work to continue under dry conditions on the running floor. Roofing work is advancing in spite of unhelpful weather conditions during the past month. This unusual construction has required a large number of workers and a security rider to the contract had to be drawn up for the six companies taken on to do this work, SUVA and Losinger. Several special safety solutions for the workers had to be found: working in gondolas, using lifelines to make sure the fall-nets work effectively and placing several nets around the construction. Construction has been underway on the south side of the route cantonale for several months now. 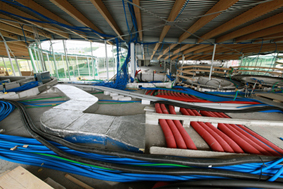 Work on the underpasses that will link the main campus with the new student housing units and the Starling Hotel at EPFL will begin October 15, 2008. The first step involves re-routing the conduits along the route cantonale. After that, a detour will be put in place so the underpasses can be built. These projects should be completed by August 2009, but in the meantime, frequent adjustments to the route cantonale will have to be made. We urge you to remain very vigilant during this entire period. Please note also that the bike route along this portion of the route cantonale has been closed, and a detour passing through the interior of the campus has been put in place. We'd like to take advantage of this opportunity to encourage you to help reduce vehicle traffic on campus by using public transport (the M1, bus from Morges), bicycle, or carsharing as much as possible during this time. The recent Mobility offer to EPFL staff and students is also an inexpensive carsharing option when traveling to or from the EPFL campus. I'm constantly amazed by the curves of the new building that Losinger and its team are putting up. It's one thing to lean over the scale model and follow the curves and the holes for the building but it's something else entirely – and far more impressive – to try to follow the line, with your finger, of the concrete waves that now ripple over the old Mécanique parking lot. While the unsheathing of the small shell pleasantly surprised many people, I'm willing to bet that the sight of the large shell convinced the rest of the world. The building that was at the center of so much debate, that we've wanted so badly, is finally taking form, and now it's here to stay. As classes get underway again all eyes and ears on campus are on the site, with crazy rumors circulating everywhere ! Roger: "I've heard that the shells caved in!" Roger : "Really – by 16cm, I promise!" Francoise: "No kidding! It'll never stand up. I must say . . ."
Let's take advantage of this space to put the church back in the heart of the village, or in this case, civil engineering at the center of the EPFL (the Ecole Polytechnique Fédérale de Lausanne)! Let's first look at the large shell. It took Losinger and its team about 50 hours and 300 men and 4,300 m3 of concrete to create the largest wave in the Rolex Learning Center. The vacation gave it a break, too, allowing it to settle in, while automatic sprinklers took care of keeping it humid. At the grand old age of 21 days the large shell was performing as it was expected to, with numbers such as elasticity of 36.7 kN/mm2 and compression resistance 60N/mm2. A few days later, the concrete form support was freed and could be lowered by about 5 cm. Several jacks supported 50-100 tons, and 4,400 restraining braces were used to help the large shell shift down. This all took place with constant monitoring, so that the large shell gently eased down as if it were the most normal thing in the world. The deformation that was seen, as Roger noted, one week after this operation, was 4 cm maximum, exactly in line with what was expected. Everything was calculated in advance and we can count on Losinger for the curves of the future heart of the campus to be good and solid! When the large shell can be completely freed of its corset of 1,150 forms these will be pulverized and used as combustible material in a heating unit not far from the campus. While we're waiting to see the inner curves of the large shell, the workers have started to put up the frame. This will only be visible in the multi-use areas designed for concerts, shows and conferences – in the rest of the building all you'll see is false ceilings! Make a circle by putting together your thumbs and your index fingers and you'll have an idea of the size of the 190 circular columns, which are 127mm in diameter. Don't worry, Roger: here, too, everything has been calculated precisely, including the 240 rectangular columns spread around the patios to support the frame. And then there is the millefeuille fine-layer roofing which is made up of a steel container with a vapor shield, a layer of insulation and a waterresistant layer?. The heads of the dear EPFL students will be well protected! And so, Roger and Françoise, stay tuned to all those crazy rumors. Word is getting around that they're planning an open house for the work site! And Saturday 4 October from 13:00-17:00. You’ll be able to visit the building site and meet the people, from EPFL and outside, who have been the main actors in this unusual construction project. You will also be able to visit the "living campus" exhibit which has been brought up to date for the occasion, with its drawings and scale models of the main construction projects yet to come. Sunday 5 October from 10:00-17:00. That's what the architects and engineers for the Rolex Learning Center exclaimed at the end of May when the small shell finally shed its formwork. The first stage of this technological marvel has been a success. The high quality of the work by all the teams on the site has contributed to this and congratulations are in order. But work remains before the final victory, from the lower floor where the concrete must still be poured for three slabs out of the total of 36, to a multitude of small, varied tasks that are necessary to meet Minergie norms. The small shell, freshly finished, has already served as an umbrella for the workers, who celebrated with a giant paella during a brief construction pause before starting the next battle: the large shell! The center is well ahead of the building calendar but no one is easing up for this next major challenge: the iron workers, the cement pourers, the people hosing down the cement to make sure no structural deformations appear under the influence of summer heat. All systems are go in terms of safety and making sure the project moves along smoothly. And what a project! Some 4,300 m3 of cement poured in one go in less than 48 hours (11-13 July). Now we're waiting for 70 journeymen to add their skills to those of the 50 already on the work site. In one corner of the building site a team of specialists from several fields is already poring over the next set of challenges ! once the two shells are poured and their forms removed a roof will need to go up, right? For now, the main concern is finding the best solutions for the structural test, on the order of 180m2! And during all of this, 1,400 visitors have been to the site since March 2008. 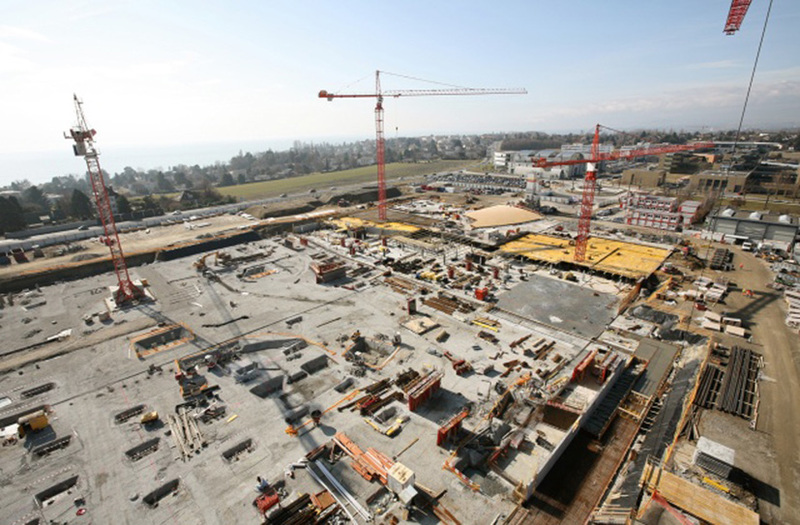 More than 7,000m3 of cement have already been poured at the Rolex Learning Center site! It represents 80% of the ground-level foundation and half (editor's note: only!) of the underground foundation slab. The hub that's developed on the work site has not paused for a minute, and it won't be taking a break anytime soon. The small shell, completely lined, will soon be filled with 900m3 of cement poured in one go. Watch out for faults and bubbles! On the other hand, don't worry: the experts are there, keeping a careful eye on every drop. We can now admire this little shell, sitting in its jewelry box, when we go by the work site ? but we should remind ourselves that the shuttering also required a special production worksite and dedicated workplace and design team. This was all pulled together long before the first person set foot on the Rolex Learning Center construction site. - When you enter by the lake road take a look at the southeast corner of the site: you'll see several of the curves, or ?waves? for the future building. - When you're on the parking lot road be sure to notice the fence, which will give you an idea of what's going on behind it, thanks to the handiwork of some of the EPFL architecture students, under the guiding hand of Professor Guger. Do take a peek through one of the peepholes. - And if mathematics and mathematicians don't scare you, pay them a short visit in their building. In particular check out their terrace where the view of the worksite is startling and magnificent! - If you want to explore Campus 2010 in all its glory you should be aware that the Pavillon Jaune has been repainted ? white ? and that it now houses an exhibit with all of the current and future projects of the EPFL campus. In a small room you'll find the original model, and you'll be able to trace the development of the campus from the early dreams of Professor Maurice Cosandey through to those of President Aebischer. The pavilion is happy to welcome you every day, 12:00-14:00. Enjoy your explorations and see you again soon! 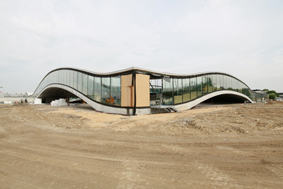 The ceremony to lay the foundation stone for the Rolex Learning Center took place on February 12. 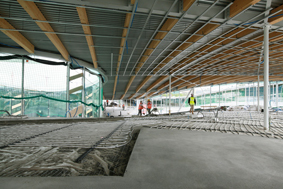 A quarter of a cubic meter collection of documents of all kinds was put together by the faculties and general service staff of EPFL, then buried for years under the concrete slab of the new library. If you were part of the group of 600 people who were there that day you will have seen for yourself how far along the construction has come. You might also have noticed helmeted and yellow vested workers in several areas. Each movement they make adds to the growing success of this job. There's nothing left to chance with this ballet: several major steps in the construction process are happening simultaneously : the slab, ironworks, air shafts and buried network of cables. It would be impossible to manage this without, at the very least, considerable coordination. The deputy director's job is to juggle the programming for all this, to make sure that each step is done as efficiently as possible. The main job of the many partners who are working together on the site is to make sure that they move from the drawings to carrying out the work, always ensuring that quality, deadlines and cost agreements are observed. A construction site is first and foremost a business of teamwork, it should be said. Everyone must pull together, from the ironworkers to the masons and the engineers who deal with the complex issues that arise. Some members of the team build and build while others have moved on to concrete testing and quality control tests (already!). The goal laid out by the team led by Losinger is to deliver a completely new kind of building of the highest quality while respecting an ambitious schedule, always keeping an eye on the security of everyone involved. Strong foundations to start the year! That's it ! the last of the 614 posts that make up the foundation of the Rolex Learning Center are in place! The teams working on the building site are now moving on to the 19,200m2 of foundation-raft and the 460 meters of the underground outer wall. Some 4,550m2 of cement have already been poured at the building site, which means we've reached eight of the 36 stages in the construction process! The figures for the future center of the Ecublens campus continue to impress. In 2007 I talked to you about the first attempts to form the two shells. The smallest was removed from its mold January 10, with some considerable effort. Let's hope this doesn't continue! This little taste, in advance, of the final building architecture and the technical experience we gathered were well worth the trouble. They'll help us improve crucial technical issues such as joints and casings, the type of cement. It's not just mechanical shovels and cement mixers that are busy on the site ! We have minds hard at work at the Agency! Engineers and architects are working together every day to find technical solutions that will suit everyone. One group is keeping an eye on the architectural concept while the other makes sure everything stays upright! The next challenge for this superb team: the facades and framework that will have the heavy task of creating the perfect marriage between the arches and the patios of this future handiwork. Plenty of challenges lie ahead as we embark on this new year! Meanwhile, best wishes to you for 2008!